The Amasty Admin Bookmarks extension is another handy time-saver for the Magento backend. With its help, you can add customizable quick-links to the admin panel that essentially simplify navigation through backend pages. Below, we review the module’s core features and describe its backend functionality. With Amasty Admin Bookmarks for Magento 2 and 1, you will be able to return to all frequently visited pages in just one click by previously bookmarking them. Furthermore, it makes possible bookmarking filtered data and creating various bookmarks for different store views. Besides, you are free to use any names for your bookmarks. Sharing bookmarks is also allowed; at the same time, you can give separate access to each admin user. Thus, Amasty Admin Bookmarks for Magento 2 and 1 lets you optimize the work of your store. The improved navigation around the admin panel simplifies daily routine saving your time and streamlining your work. 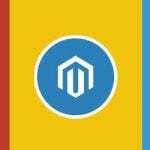 It makes the Magento backend much more user-friendly by providing the ability to save URLs to a bar at the top of the admin panel so that any page can be reached in just one click. Each quick link can be easily removed, so you can always keep the bar clear. 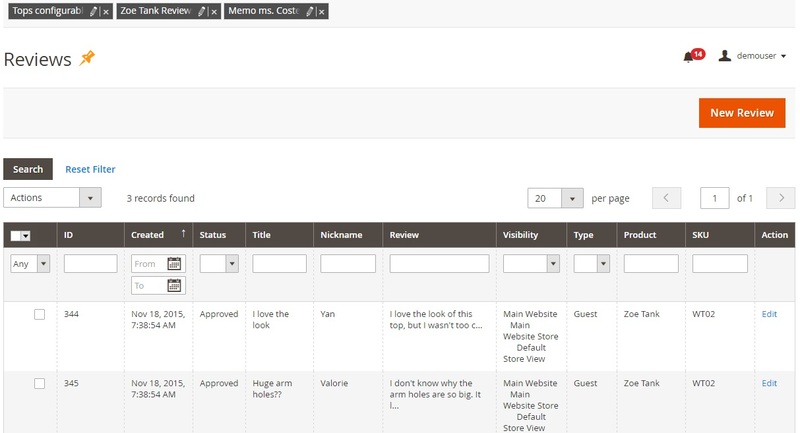 Moreover, due to the ability to save pages with filtered data, the Amasty Admin Bookmarks extension becomes especially useful in case you have to deal with customer segmentation or products with different parameters. Both situations require applying filters every time you view a certain page. 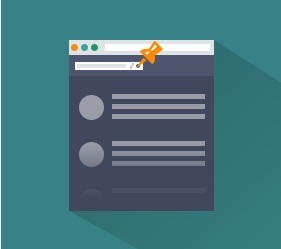 To avoid this time-consuming process, you can bookmark a page when filters are applied. Next time you visit the page using the quick link, all filters will be applied automatically. Note that it is possible to bookmark pages for different store views. Choose a store view and bookmark a page – it will be saved for the selected store. 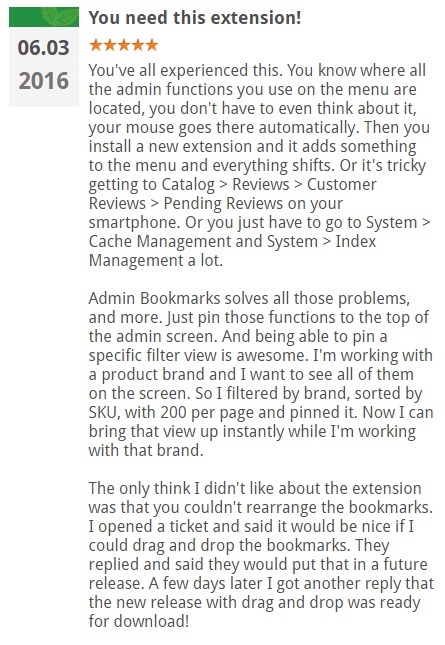 To rapidly recognize each bookmark, the extension allows you to rename each tab. The feature is vital for the situation when you need to save the same page several times (e.g., with different filters). Each admin user can create separate bookmarks. It is only necessary to set “Share bookmarks” option to “No”, and nobody will be able to view or use anybody else’s bookmarks. 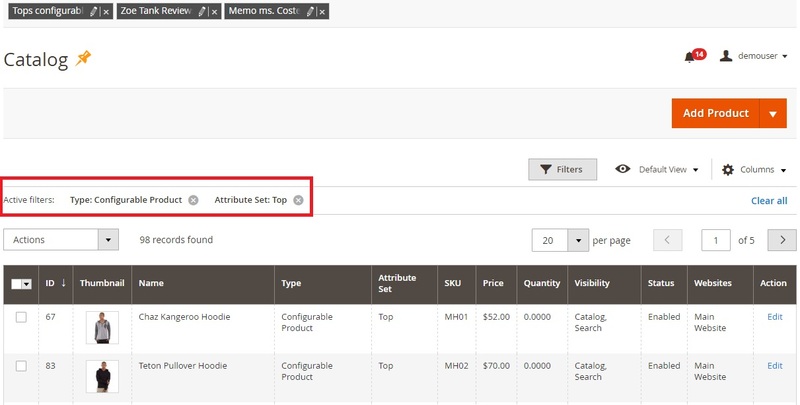 Thus, the module helps to differentiate the work and make it more comfortable for each admin user. At the same time, if the option is set to “Yes”, all users get the access to all bookmarks – quite handy when your team has the same task working on the same project. Below, you can see the top bar with bookmarks mentioned before. In the demo version of the extension, there are three bookmarks: Tops Configurable, Zoe Tank Reviews, and Memo ms. Costello. The Tops Configurable pin illustrates the example of a page with already applied filters. They are: ‘Type: Configurable Product’ and ‘Attribute Set: Top’. The Zoe Tank Reviews page leads you to a grid with reviews on a product called Zoe Tank. Memo ms. Costello displays the appropriate memo. To create a new bookmark, just hit the pin icon near the page title. Now, let’s go to Stores -> Settings -> Configuration -> Amasty Extensions -> Admin Bookmarks. Here you can enable/disable the top bookmarks bar and activate the Shared Bookmarks feature. As mentioned above, all admin users share the same list of bookmarks if it is turned on. As you can see, the extension turns backend navigation into fun. You no longer have to spend hours of time surfing your admin and applying filters: just do it once and save necessary bookmarks. Amasty Admin Bookmarks for Magento 2 costs $119; for Magento 1 version, you will need to pay only $59.